The colorway is called Alpine Meadow and it is so cheerful. 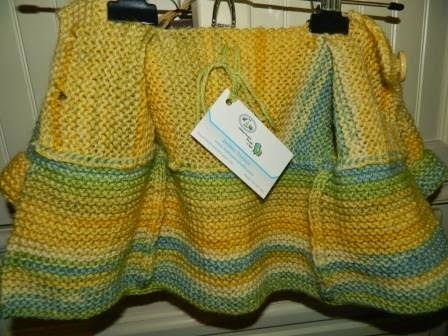 Shades of Yellow with pale green and a hint of turquoise, this is Lion Brand Baby Wool. I found the yarn on a visit to the Lion Brand outlet here in New Jersey. A search of the Lion Brand pattern database uncovered the pattern. It is the Sideways Cardigan Pattern #90738AD. 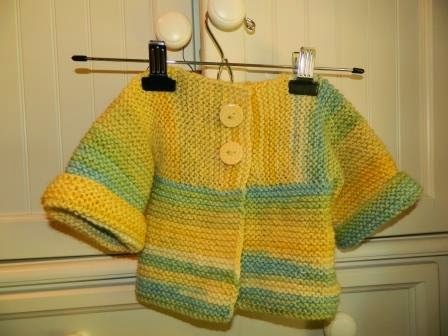 I really enjoyed knitting this little jacket. Starting at the right cuff, the pattern has you knit across to the left cuff. Then the directions call for picking up stitches for the back and each front separately. Since, I didn’t want to deal with the seams, I picked up all the stitches at once. To add side shaping, I knit the 2 underarm stitches in reverse stockinette. You can see the line in the photo below. The only finishing was the sleeve seams and the 2 buttons. I had the yellow buttons in my stash. They are a little larger than the pattern calls for but work well. So this is ready for my gift pile. I don’t know who will be the recipient of this sweater but I love having gifts ready to give away. I’ll be using some of my stash yarn to make this sweater again. Finished it in record time.